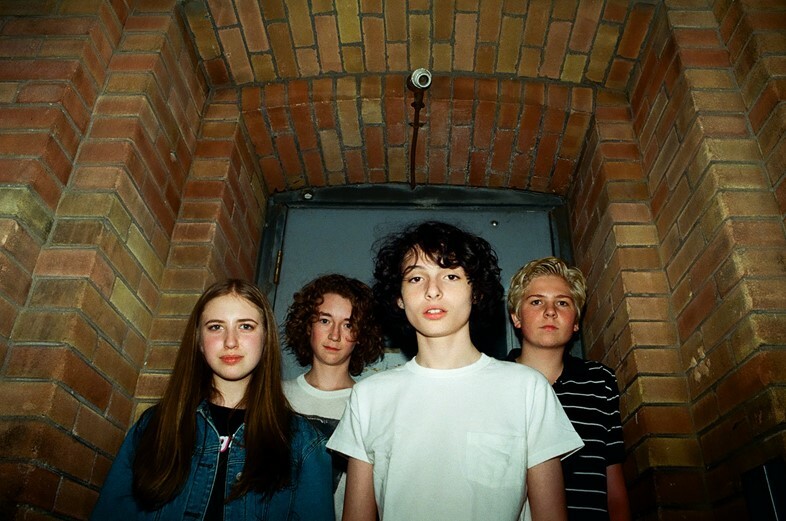 Calpurnia started as just another teen band jamming out, but unlike most other teenagers’ bands, their lead singer is one of the most famous young stars on the planet. With Finn Wolfhard – still reeling from the popularity of portraying Mike Wheeler on Netflix’s Stranger Things – fronting the group, Calpurnia had captured the world’s attention before anyone had even heard a note. But at the end of the day, the Vancouver indie rock quartet are much like any other burgeoning band, which each of its members – Wolfhard (15, vocals), Ayla Tesler-Mabe (17, guitar), Malcolm Craig (15, drums), and Jack Anderson (17, drums) – having their respective areas of expertise, whether that’s classic rock, jazz, or heady psychedelia. The band began as a group of friends who enjoyed playing music together. Wolfhard met Craig while filming a music video, Tesler-Mabe was a buddy from rock camp, and Anderson when they wanted to play a charity fundraiser together. For the past few years, Calpurnia have been playing for fun in Vancouver, showing off some of their favorite covers, like “Butterfly” by Twin Peaks, one of Wolfhard’s favourite groups. Coincidentally, his Stranger Things co-star Joe Keery played in the Chicago band Post Animal, and was roommates and best friends with Twin Peaks. After Wolfhard asked for lead vocalist Cadien Lake James’ phone number, the duo hit it off and began exchanging music as friends. 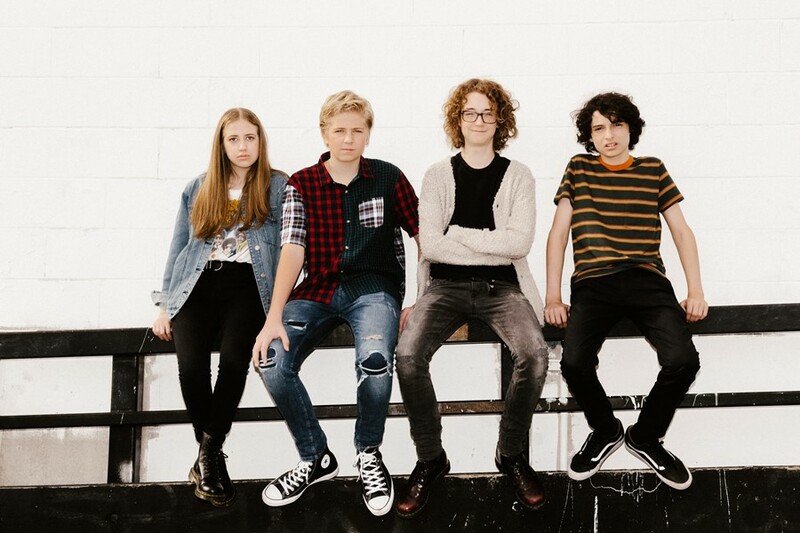 Their music resonated enough with Cadien that he ended up producing Calpurnia’s debut EP, Scout – though they’d have been just as happy satisfied recording it in Tesler-Mabe’s basement. The result is a mix of slacker anthems, spaced-out rock tracks and clever storytelling. Calpurnia are friends first, musicians second, and they’re ready to let people hear what they have to say. As they release their new track, “Louie”, we caught up with the group to talk about their debut EP, working with Twin Peaks, and their love of The Beatles. Finn Wolfhard: I met Malcolm, the drummer, on the set of an indie music video for the band PUP (Finn starred in the Canadian band’s video for “Guilt Trip”). We met (because we were) acting together. I found out he played drums, and I played bass at the time, so we just played a lot with each other. We wanted to learn how to write music. We did this rock camp together where you learn how to write and record and write with different groups of people, and that’s where we met Ayla. Then we’ve just been jamming together. Ayla Tesler-Mabe: I met Jack when I was in grade two because we go to the same school. We both inspired each other to start playing because we both love The Beatles, we struck up a friendship and we used to jam together. Through that we all met each other and it all worked out. You obviously just referenced The Beatles, but what else did you guys grow up listening to? Finn Wolfhard: A lot of classic rock, Led Zeppelin, and also a lot of indie music too. On my way home from being born, my dad played (Weezer’s) The Blue Album in the car. Stuff like Nirvana, The Pixies, The Breeders, and rock in general. Ayla Tesler-Mabe: It all started with The Beatles and progressed (from there). I listened to a lot of classic rock – now (I listen to) a lot of blues and jazz. When I was younger, I listened to a lot of Latin music because my parents are South American, like Buena Vista Social Club and The Gypsy Kings. I love Miles Davis and Stevie Wonder, The Jimi Hendrix Experience, and B.B. King. Malcolm Craig: Pretty much the same thing as Finn. But my parents listened to this mix I hated as a kid, but now love – stuff like Beck, LCD Soundsystem, Grizzly Bear, Panda Bear. Finn Wolfhard: For all of us, The Beatles are number one. Finn and Malcolm, you guys met during the PUP music video filming. What spurred the idea for the band? Finn Wolfhard: The three of us (Ayla, Malcolm, and I), we just played together for a long time. We didn’t think about playing live. From then, I was talking to this charity called Sweet Relief that had fundraisers to pay musicians’ medical bills that (they) couldn’t afford, which I thought was really cool, so I wanted to put on a fundraiser festival where bands could play. I realised I needed a band, so I had Malcolm and Ayla, but I had no bassist. I met Jack super briefly right before and I knew he played bass. Jack Anderson: It was pretty good. We came together for one gig, but it turned out to be so much more. Twin Peaks ended up producing your EP, which is pretty cool. How did you meet the guys from the band? Finn Wolfhard: I’m not a savant when it comes to connections and networking, but when it comes to people I respect it’s kind of a deal-breaker if my heroes are right at my fingertips. Joe Keery, who is in Stranger Things, has a band called Post Animal in Chicago and they’re best friends with Twin Peaks – they lived together for a long time. My friend Chloe introduced me to (Twin Peaks’) music, so I asked Joe for Cadien (James, Twin Peaks singer)’s number. I found out he was following me on Instagram! I would just send him song ideas as a friend, and then when we were talking about doing the EP, what came from a friendship became a brotherhood. He ended up producing the EP. Andrew Humphrey is a tech-mixing wizard and Colin Croom, who is the keyboardist, came in a lot and played keys and backup guitar. They all produced it together, basically. That’s how it all came together. We recorded for 10 days in a studio in Chicago. Malcolm Craig: The “Wanted You” video we did in July certainly helped. We were always planning to record the EP, but in Ayla’s basement, and that showed Cadien we were a serious band. He was like, “Yeah let’s do it”. Obviously you guys have covered Twin Peaks before. What song was your gateway drug? Finn Wolfhard: Everyone’s gateway track was “Making Breakfast”, but mine was a song called “Good Lovin”. Both are off of Wild Onion. It’s still all I listen to. They’ve been my favourite band for two years now. Some bands I’m obsessed with but I get sick of listening to their music after a while, but that hasn’t happened with Twin Peaks. Finn Wolfhard: We got on a Skype call – I was in Atlanta at the time – (and) we went through a few (names) that were terrible. I was like, “Let me see if I have any in my iPhone notes,” and there was one from two years ago – it was “Calpernia” with an “e” and not a “u.” I think it was my dad that said to change it to a “u.” There’s a trans model who is called Calpernia, so there’s a disconnect there – you don’t want to steal their image. Ayla Tesler-Mabe: On the call, the first thing we said was that it was a character in To Kill A Mockingbird. I think it’s a great book to be referencing. It’s an important and powerful character. It’s a beautiful metaphor up to your own interpretation. I like what the name has become. Finn Wolfhard: I think why I put it in my phone is that she’s the person to keep everyone safe and well-fed (in the book). She sees the family from complete destruction within. She’s an underrated character and no one ever talks about her. Tell me the story behind “Louie”, which comes out today. Finn Wolfhard: “Louie” is the first track – the somewhat acoustic track that opens up (the EP). I was listening to a lot of Lou Reed when I wrote it, so we named the song after him. The song isn’t exactly Lou Reed’s music or anything, but I was just inspired by him in general. I was writing it and thought of the concept of a guy who just leaves this girl to his own devices and just never shows up or never comes back. Do you guys feel like you need to prove yourselves as artists? Finn Wolfhard: Sometimes that comes up in your brain, but I think half of it is “yes” and half of it is “no”. The “yes” part is proving to people that young people can play music just as well as adults. The “no” part is, why do you have to prove yourself to anyone? Both are valid. We’re just having fun, so I don’t think we’re really thinking all the time if they’re gonna hate us. Ayla Tesler-Mabe: We’re four people who love each other as friends and we ground ourselves in that we love what we’re doing at the end of the day. If you love what you’re doing, the rest falls together naturally. Has Stranger Things had an influence on the music at all? Finn Wolfhard: No, not really. Jack Anderson: You found Joy Division through it! Finn Wolfhard: I got into the Joy Division song “Atmosphere” (when that) was in it. The Stranger Things soundtrack is so good, but it has nothing to do with this project. Obviously Stranger Things has given me the launching pad to have creative license for whatever I want, and I love doing the show, but when it comes to music, I want to distance myself as much as possible. It would be weird to play a Stranger Things prom all dressed up like the Stranger Things characters. Do you have a full record written? Jack Anderson: We have the EP written and done. We have 20+ ideas we’re working with and toying with. It’s like when you get that lump of clay on the pottery wheel. We’re about to squeeze the lump of clay and turn it into a vase. Finn Wolfhard: My schedule is so crazy and I love to do a lot of different stuff, so it’s all about finding that time, but hopefully as soon as possible. You’re signed to Royal Mountain Records in the US/Canada and ParadYse/Transgressive in the UK/Europe. What’s been your experience working with indie labels? Jack Anderson: (With Royal Mountain,) it’s a band manager running it. It’s grown to be a pretty well-oiled machine. Finn Wolfhard: If I was just doing this by myself as “the Stranger Things kid”, maybe I could have gone to a big label, but I think what I like about indie labels is that they’re small, compact and people know what they’re doing. The people who started them usually know what young people are listening to and what young people want. It’s a real family, they’re always at our shows. What’s wrong with these big labels is it’s a bunch of older dudes or women being like, “what are the young people into today?” And it’s like, “My niece really likes these things called ‘fidget-spinners’, so maybe we can do something with that?” Guessing what kids like is not good.